I have been a little bit quiet on the skincare front recently, and that’s because I’ve wiped my whole shelf clean apart from just two or three products. I’m doing a little experiment, you see. A minimalist one. I’ll tell you all about it next week or perhaps the week after, when I’ve given my new routine a fair chance. Anyway, pre-experiment I used the Kiehl’s Ultra Facial Overnight Hydrating Masque and was very impressed. A lot of overnight masks seem to be a waste of space – not even as moisturising as a completely unremarkable face cream – but this one is good. Skin looks plump and fresh in the morning and (on my skin at least) there’s still a bit of mask leftover to rinse off. I kind of think that if a mask completely absorbs within minutes (seconds, even) then it’s not really a mask. It’s just a moisturiser. 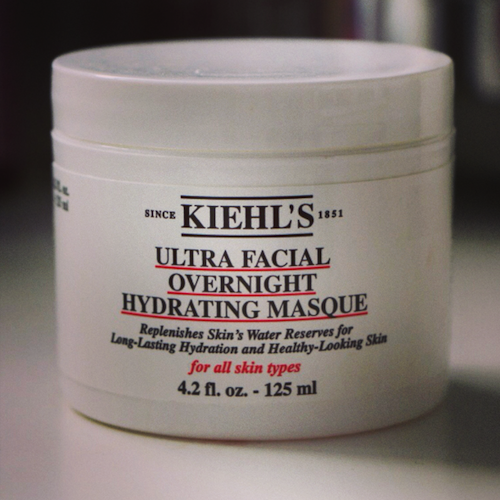 The Kiehl’s version seems to be cut out for longer-term rehydration. So, the Ultra Facial Overnight Hydrating Masque. Great for dehydrated skin or skin that’s about to be severely dehydrated (read: hangover). If you’ve overdone the wine then may I recommend two Alka Seltzers before bed and a thin layer of this face mask? Works wonders. It’s actually OK on all skin types, too – it’s not rich or oily so you should be fine if you have skin that’s prone to breakouts. Great, also, if you’ve gone a bit crazy with your exfoliants and your skin feels a bit tight and out-of-sorts. Ooh – last thing: aftersun! If you want something lighter than the magnificent Decleor High Repair After-Sun Balm (I always used to take this away on hols with me, then lost it, must get more!) and you just want to concentrate on getting some moisture back in, then this is a Pot of Dreams. Previous Post “Get The Gloss” on Ruth Crilly!